Thin Mints are those Girl Scout Cookies that I can eat an entire tube of in a sitting. 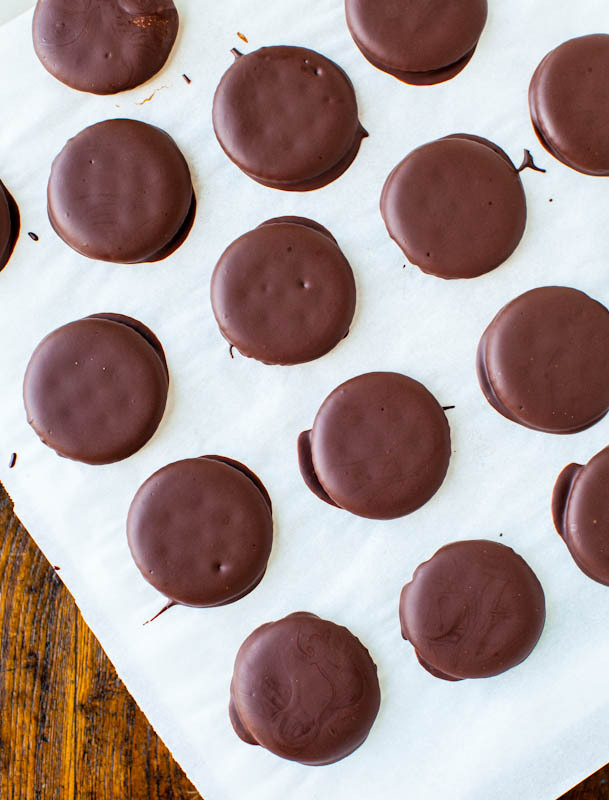 Since my cravings for mint in the middle of the summer continued, I decided to try my hand at a homemade, no-bake, vegan version of Thin Mints. 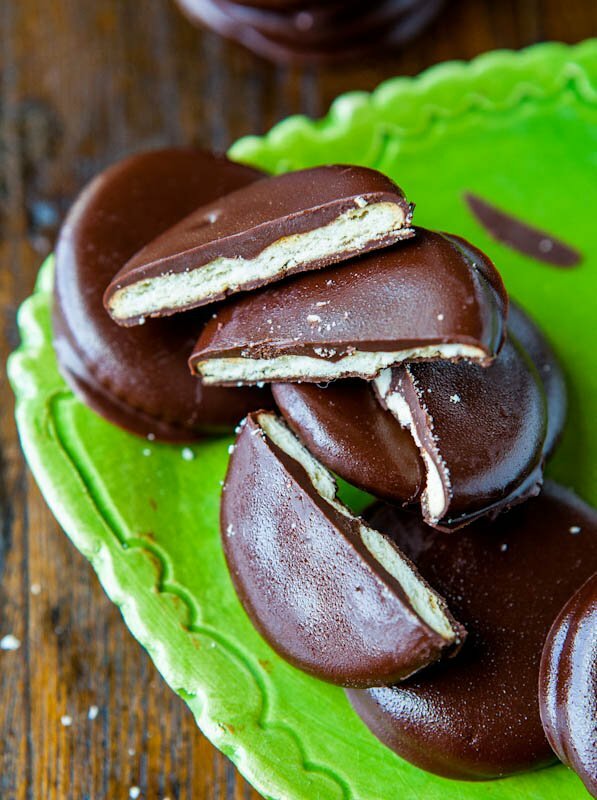 They should be called Thin Mints Cheater’s Mints. 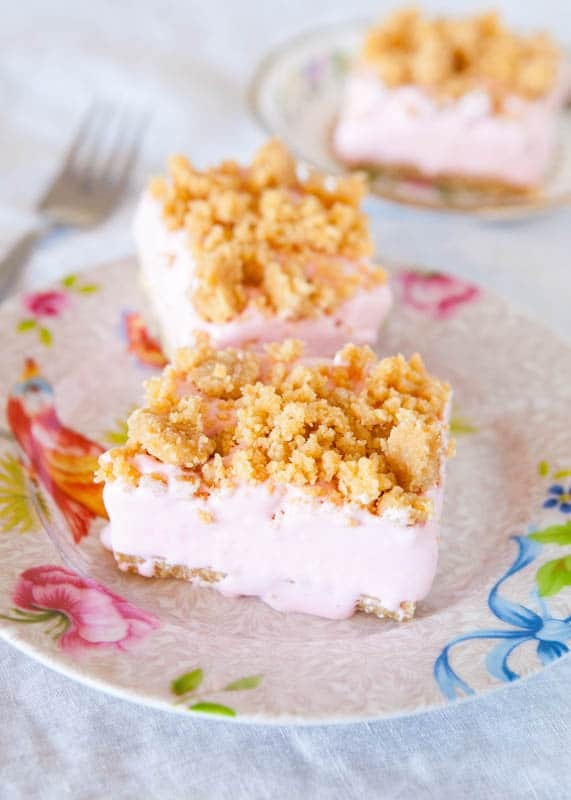 No-bake and so easy. What’s the catch you’re wondering? I promise these cookies don’t taste like crackers. The crackers provide a neutral base layer, nice crunch, and are a dead-ringer in size and shape for what will become cookies. 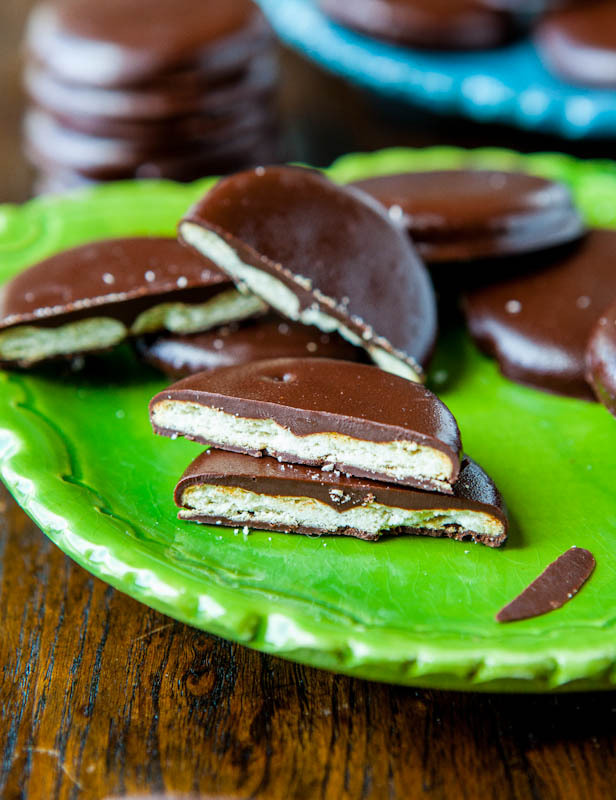 When they’re drenched in mint-flavored chocolate, you won’t know it’s a cracker or care that it started out as a cracker. 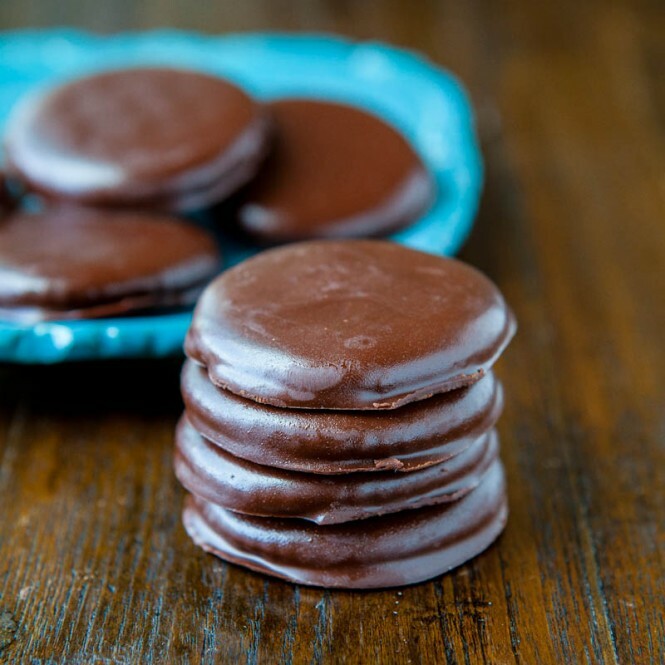 These Thin Mints taste incredibly close to the real thing and take all of 15 minutes to make. Melt the chocolate and shortening. I highly recommend a tablespoon of shortening for any chocolate dipping projects because it keeps the chocolate smooth, viscous, and much less likely to get that hard-before-you-want-it-to and clumpy consistency. Add peppermint extract to the melted chocolate and get ready to dippity do. As with my last recipe and caveat about peppermint extract, make sure you read my disclaimer in the recipe box below. Place dipped crackers, which I now think of as cookies, on parchment paper. Food goes from cracker status to cookie status the minute chocolate is involved. Wait for the chocolate to solidify and firm up before digging in. Because of the shortening, it could take a half hour or more at room temperature for the chocolate to solidify, especially if you decide to do this project on an 80 degree day in the middle of summer without running your air. Pop the tray in the refrigerator or freezer to speed things up. I like them better chilled anyway and store them in the freezer. The minute I took these out of the freezer, the condensation on the chocolate began. It reminded me of Christmas Crack in Aruba. Nothing you can do when it starts. It was a hot day in San Diego the day I made these and as the 3pm sun was shining in on my photography table, both me and the cookies began to sweat. The cool mint was perfect. 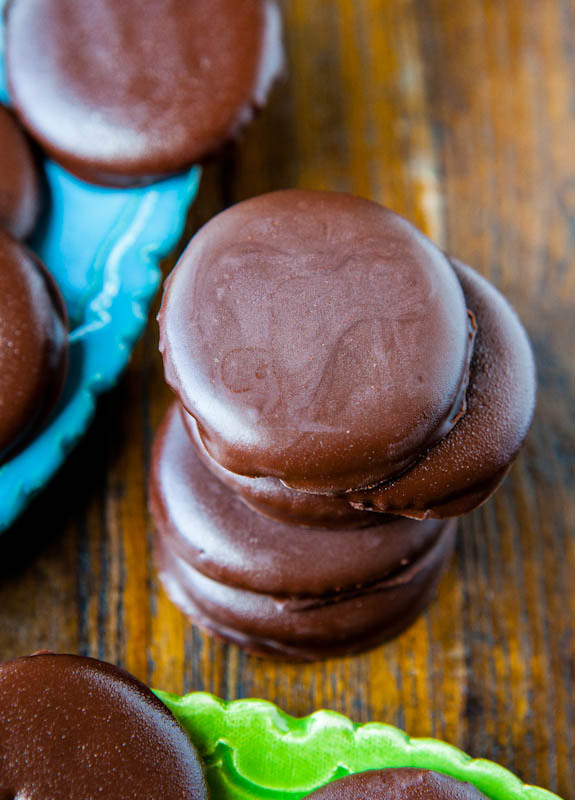 Just 3 ingredients in these Homemade Thin Mints that taste like the real thing, and no one ever guesses what the ‘secret ingredient’ is. Incredibly easy to make, always a hit at parties, and now you can make your own Thin Mints any time of year and don’t have to wait for cookie season! Prepare a baking sheet by lining it with parchment paper or wax paper; set aside. Clear out a spot in your refrigerator or freezer to accommodate baking sheet. In a shallow microwave-safe bowl, combine chocolate chips and shortening (the shortening helps the chocolate stay smooth when using it for dipping; it prevents that thick and gloppy, chocolate getting hard before you want it to phenomenon) and heat for 1 minute on high power to melt. Stir and heat in 10 to 15 second bursts until chocolate can be stirred very smooth. To the melted chocolate add 1/2 teaspoon peppermint extract* and stir. If you prefer it mintier, add another 1/4 teaspoon. I used 3/4 teaspoon in total, but because all brands and taste preferences differ, taste your chocolate and add peppermint to taste. *Note: Mint extract is much, much more potent than vanilla extract; 1 teaspoon of mint extract has an extreme amount of potency compared with 1 teaspoon vanilla extract. You cannot un-do mint once added so be very, very careful to not over-do it and end up with a bottle of Listerine-tasting food. There are different kinds of mint extracts available and are labeled as “mint, “peppermint”, “spearmint” and more. For this recipe I used store-brand (Kroger/Ralph’s) “peppermint extract” sold in a small 1 ounce bottle. Select the version of “mint” you think sounds best as not all types are available in all areas. 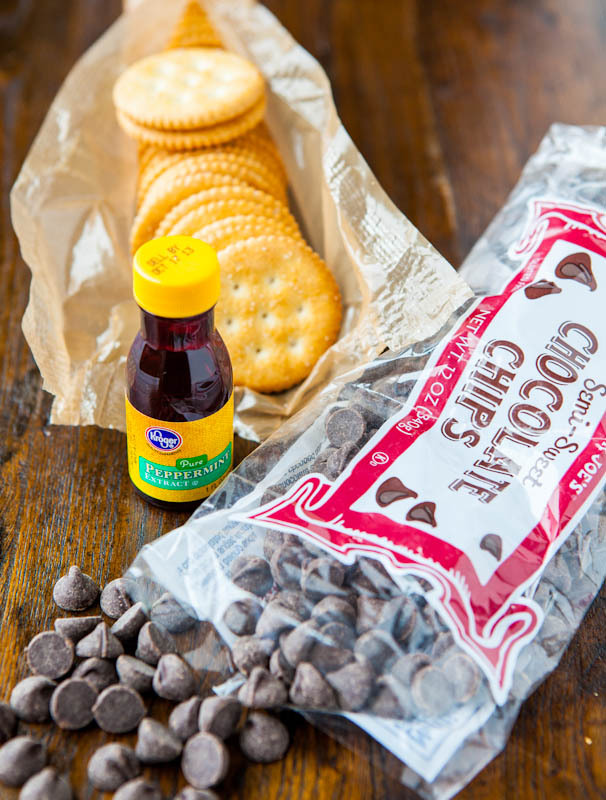 Add 1 cracker to the chocolate, coat it, and remove it by lightly scooping it up from the underside with a fork, allowing excess chocolate to drain off through fork tines. Place cracker on parchment and repeat with all remaining crackers. 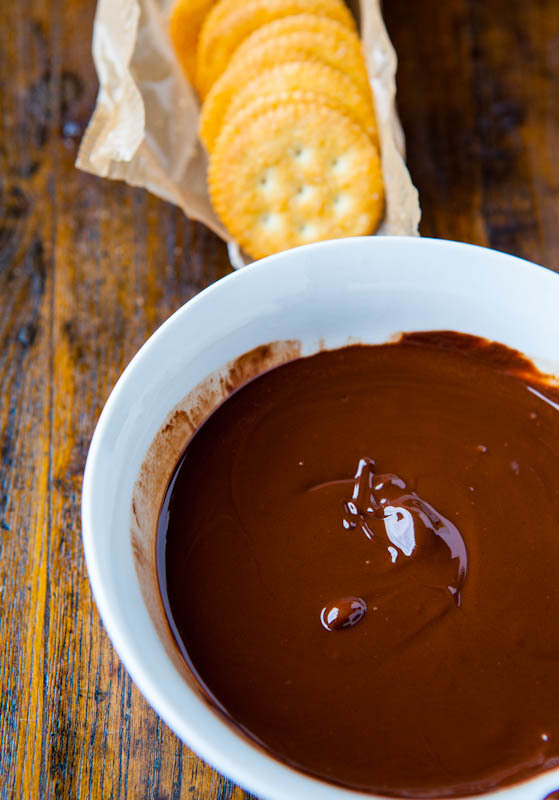 If necessary, re-heat the chocolate in 10 to 15 second bursts if it starts getting too firm for smooth dipping. After all crackers have been dipped, place baking sheet in refrigerator. Although these will solidify at room temperature, the shortening in the chocolate lengthens the amount of time that will take; the fridge or freezer helps speed it up. 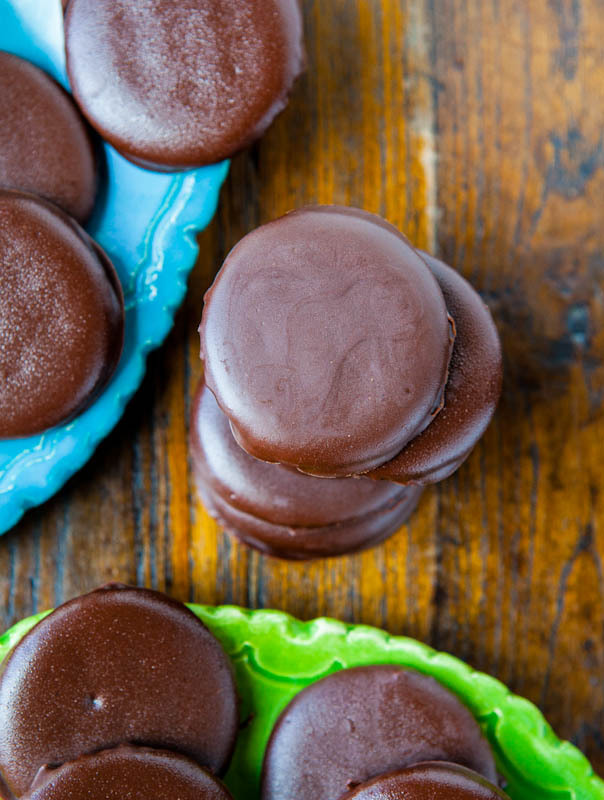 Store extra Thin Mints in an airtight container in the refrigerator for many weeks. In the freezer, I estimate that these could be kept for 3 to 6 months successfully. Do you like Thin Mints? 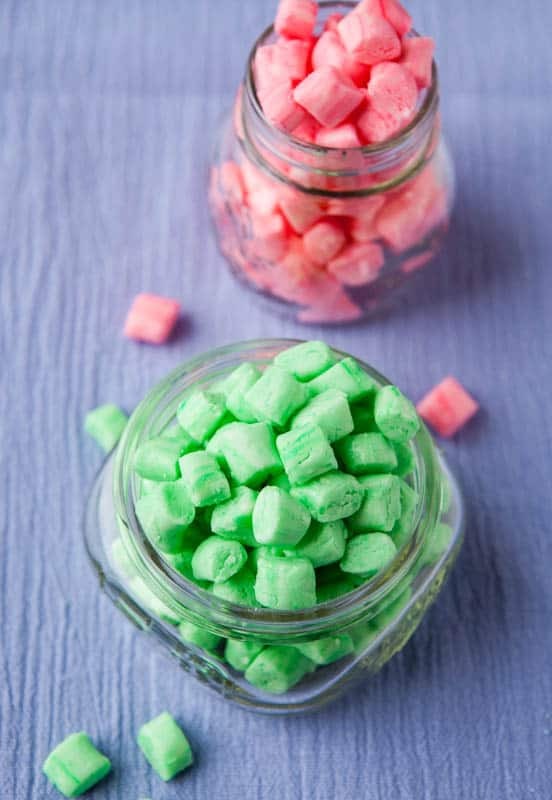 Do you like mint or have any favorite mint recipes? I am a huge Thin Mints fan and I could eat a tube in a sitting if I let myself, and for that reason, I don’t buy them. 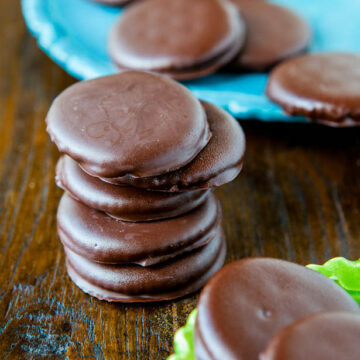 Now I have homemade Thin Mints which are maybe a little too easy, if you know what I mean. Samoas are another weaknesses and I came up with a Samoas Bars recipe, which is reminiscent of those beloved cookies. Even though many people tend use mint in their holiday baking, I think cool mint is perfect for a hot summer day. 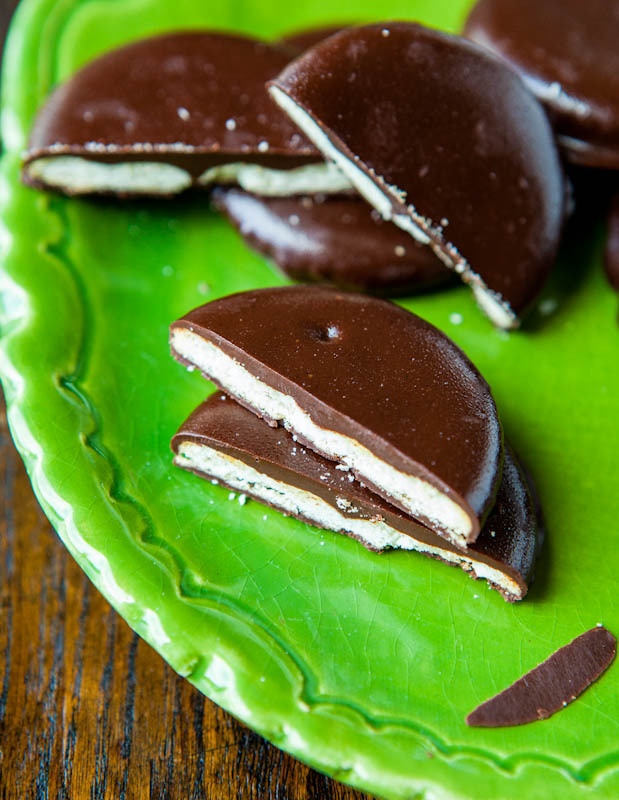 Feel free to link up any mint recipes or recipes with some time-saving or clever shortcuts (like the Ritz cracker trick). I’m all about other recipe shortcuts. Thanks for the Capresso Espresso and Cappuccino Machine Giveaway entries & have a great week! This may seem a little silly, but this is the Ritz crackers with cheese stuffing in the inside, right? Or is it just plain no stuffing Ritz crackers? 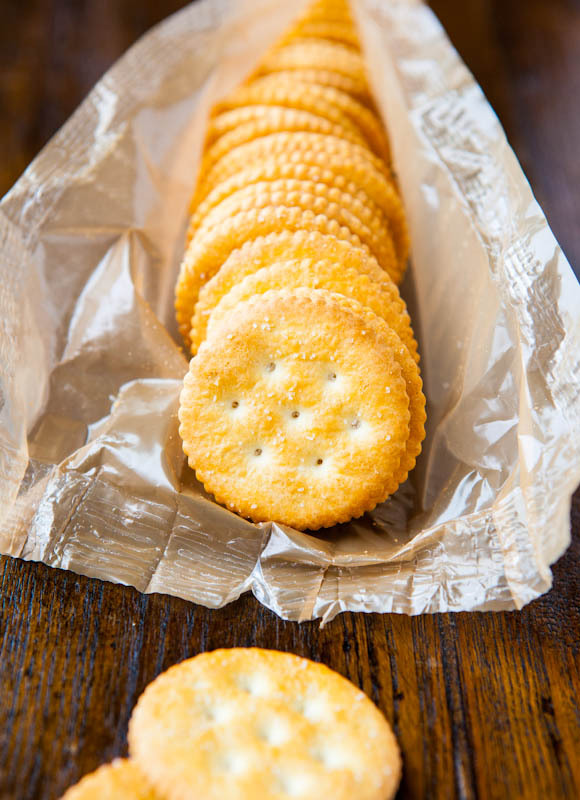 PLAIN Ritz. Old-Fashioned Ritz, not stuffed. 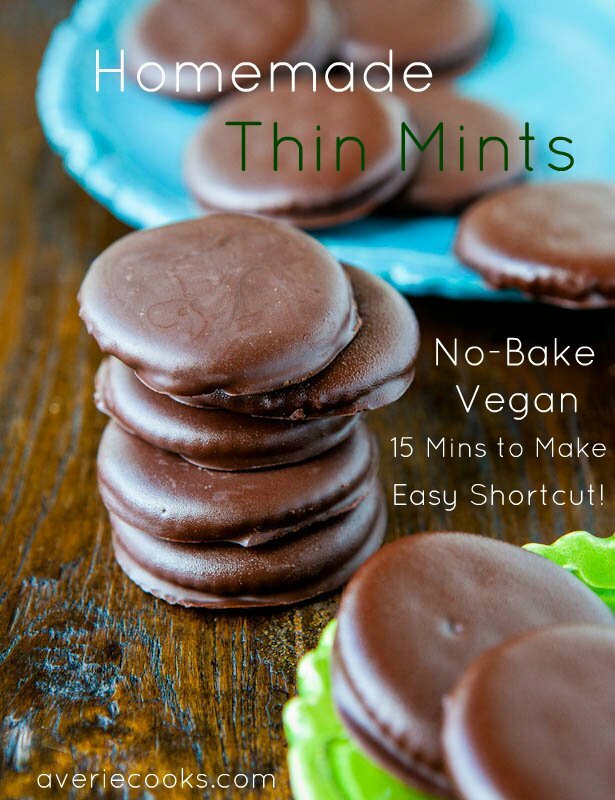 Hi, just found this recipe and want to try the Thin “cookies” with peppermint essential oil instead the extract. How much oil would I need use for one recipe? I haven’t ever tried oil rather than extract so I can’t speak to amounts. 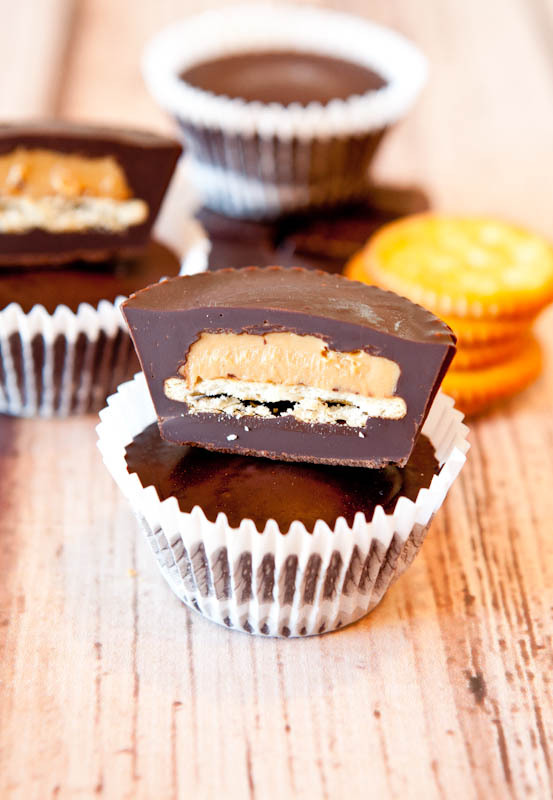 I just made these and they are amazing! Absolutely love all the detail, tips and through explanations for every recipe. Especially helpful for beginners but experts will also learn new ways to cook. My favorite site for recipes. Thanks for the compliments on my writing technique and style. I appreciate it! Why/how are the crackers green in the pic? Did i miss a step? I don’t see green crackers. You could be seeing a reflection off the green plate, that is my guess. Thanks for the five star review and I’m glad the Crisco tip helped you out!